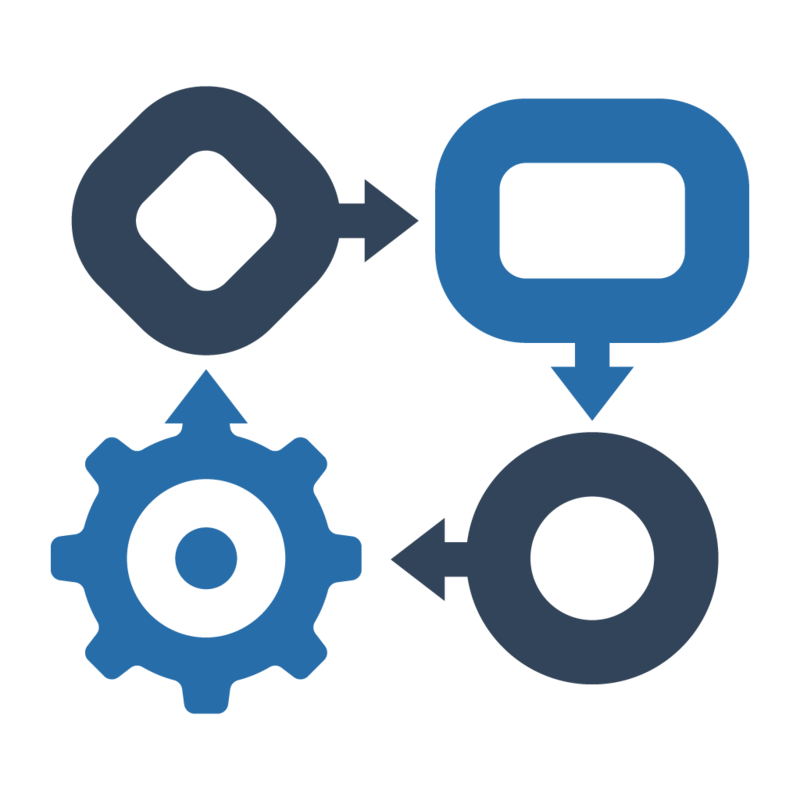 Greater efficiency is gained by using workflow to deliver documents to users that need them, when they need them. No more guessing when work needs to get done. Let the system help you manage these needs. docMgt’s unique and flexible Work Trigger system is more efficient in responding to changes in basic needs as well as those one-off emergencies that come up. Work Triggers allow you to focus on a step at a time and put them into the system simply and easily. They do not force you into a set of stringent rules regarding how and when items can move between work steps. With Work Triggers, if the works needs done then the steps will be activated and if not then they won’t. No more drawing arrows and boxes or writing scripts. Let our Work Trigger system do the hard work for you! Download the Workflow Fact Sheet for more information about the differences between workflow in docMgt and other systems. 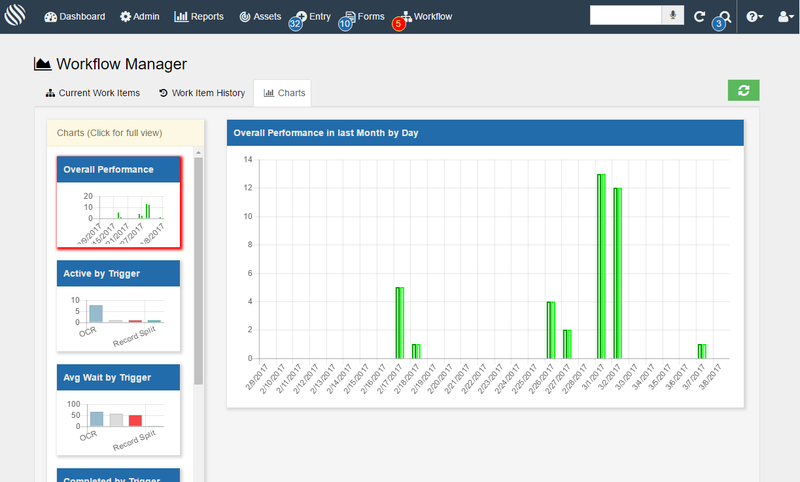 Each user also has their own workflow information panel that keeps track of their performance over the past 30 days. By reviewing this, employees can see how closely they are hitting their goals and whether they need to address an issue or their process requires any tuning. Workflow Managers have a similar panel that shows them the workflow performance across all triggers they manage. This allows them to monitor the KPI/SLA information of their processes to ensure compliance and goal attainment. They can also reassign work as needed to help spur on better productivity. Reporting users are given rights to run current and historical reports for workflow. This includes overdue reports, user workflow reports, work trigger reports and more. 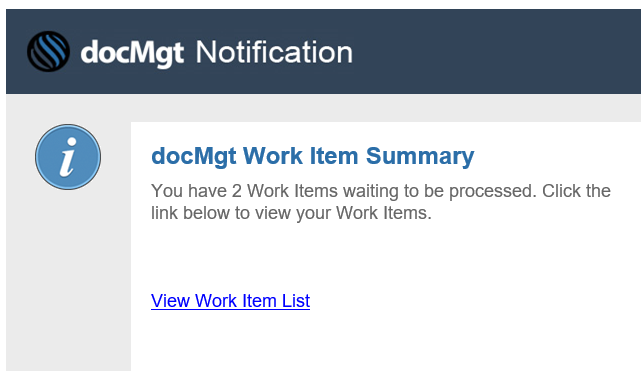 Work Triggers utilize notifications via Email, Text or the docMgt UI to let users of new work assigned to them. Each notification can be completely customized to provide the proper information each user needs to get their work done. Notifications are also available on a daily, weekly, bi-weekly or monthly basis to remind users how much they still have left to do. These are configurable at the user level so each user can decide how much notification they require for their work. Notifications can also be configured to automatically remind users on a task-by-task basis as part of the built-in Follow Up system.